SQLFiddle has been an essential tool and a great complement to dba.se for a very long time, but it has gone downhill a bit in the last year or two. I have also wondered for some time what a 'fiddle' designed specifically with dba.se and markdown in mind might look like, and over the last few days I've put together a prototype of how I think it should be. Please have a play with the site and let me know here if you have suggestions for improvements or design changes. I've edited some of my answers (e.g. this one) to use db<>fiddle. As of Apr 2018 the site uses ssl by default — there are some benefits even for a site like db<>fiddle and it's free now so why not? As of Apr 2019 you can now hide batches selectively. Thank you for this. I have been using rextester for this, but it doesn't work properly for Oracle. I don't like the tiny input field to start with. I would prefer it to be presented as a much wider (and higher) text field so that it's immediately clear that you can input more then just a few characters. It also doesn't auto-expand for subsequent statements (using Firefox on Windows 10). After pressing the + the input field stays at the initial size. You can input larger statements but you can't see them properly. I know parsing SQL is hard, but having to click the + button for each new statement is a bit cumbersome. For me syntax coloring would be appreciated. And some short-key to execute instead of click on RUN button. Of course I can create the DDL in sqlfiddle and copy to dbfiddle. But would be nice having that function included. Thank you for the site. It's generally great! Not sure how you would stop people from doing that, but you can stop me. 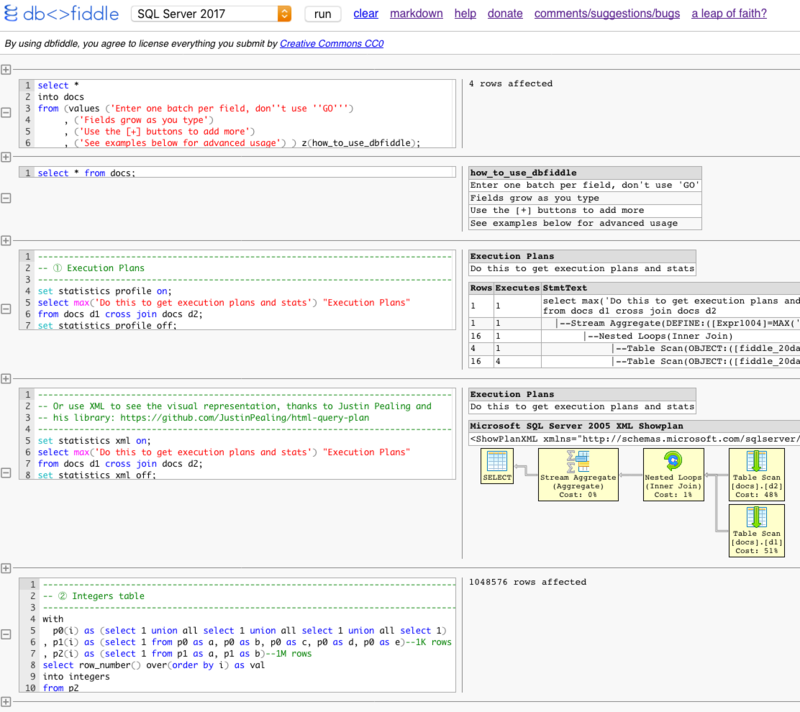 I have used the generic text "SQL Fiddle" to link to (mostly) sqlfiddle.com in the past. Do you think it's appropriate to use the same text for links to your site or do you prefer "dbfiddle" like you have it in the markup. Maybe more useful for the general public, to see where the link is going right away? There might be an option to remove an additional SQL window (except for the first one). Currently we can only add more, but there is no way back. The Plus + might flip to -. Also there might be a clear per SQL window (additionally), not just for the whole page. I like the spartan, no-nonsense design. I like that we can have any number of queries with results. It might be useful to have an option to (re-)execute only one of them. i.e. a button like run this below each SQL window in addition to the general run at the end. Might require more webdesign smarts to update only the selected section (I am no expert with this.). While the next SQL window can depend on results from the previous one, that does not have to be the case (like in my example above). Alternatively (additionally), run so far could be useful. I like that we have Postgres versions 9.4, 9.5 and 9.6 at our disposal. SQL Fiddle didn't keep up. What do you (or others) think about this alternative format for results? On-site disclosure / statements on site owner, intended use, license, update policy, expected lifetime, public visibility, privacy? I know, it's still beta. Just mentioning it. Excellent work, but I don't care much for the logo. I'm not an artist, but here's a stab at something reminiscent of what you have. If you don't like it, that's fine, but please find something else. I tried the Msft SQL Server vNext option by copying this SQL Statements to create tables and data into the first field and a working solution into the second field. You can see the result in my dbafiddle.uk. It it unclear to me what i would have to do next, to see a result? Some error message or some indication that the tables are created would be helpfull. The html structure is currently this sequence of html tags <input><textarea /><textarea />. It seems that the first textarea is used for the user to input data and the second is used to output a result for instance a ✓. I noticed that the output of my first dbfiddle was a little off (to many white space). So I forked the above dbfiddle to confirm that the cause was the RoomName [nchar](120) inside CREATE TABLE [dbo].[Rooms]... This made me aware that a fork button and a field to comment what was changed in the fork could be useful. Linking the forked fiddles could be useful as well. Another option would be to stripe (remove whitespace) of the output columns (although this might be undesired in some cases). Example: Add a table definition output for each create table-statement next to the matching textarea field like this. Thanks for making this tool! I tried to break the site. Hopefully some of this is useful feedback. Any chance of getting Oracle 12c? 11g is pretty old at this point although I think Oracle recently extended support for it. It looks like SQL Server 2014 is pretty close to RTM. If possible can you patch it, at least to SP2? Line 1: Divide by zero error encountered. Oracle - DBMS_OUTPUT.PUT_LINE does not print anything and SET SERVEROUTPUT ON is not working. It would be really useful to test PL/SQL programs. Is there any other way to see this output, other than creating a function and seeing output from a select? The images above are from a Samsung S5 using Chrome, not the largest phone screen, but also not the smallest. In landscape mode one can "just" access the Run button, but this is not possible in portrait orientation at all. While I accept that writing SQL on a phone is tedious in the extreme (well I find it is) many people do read Q/A information on such screens. It took me a few attempts to understand what "Split" does (divides a block of DDL/DML/SQL into individual parts on screen). This is unique to your user interface as far I can tell and certainly not a normal part of SQL. It also appears to be essential to your UI. It took me a little while to realize that I needed to use Markdown to locate a URL which would allow me to return to the fiddle. Removing the 9 unwanted "boxes" to produce "My Fiddle"
If I open https://dbfiddle.uk by default you display multiple "splits" which are aimed at helping "me-the-dumb-user" to understand how it works. Perhaps I'm wrong, but if I want a markdown output that is exclusively related to my own fiddle, I first need to remove these "help splits". That's 9 or so remove clicks to reach a "clean start". While help is useful for the first-time user, it's tedious for an experienced user. Why not just provide a Help link in the toolbar which displays "help"? The default screen would in that case be almost blank and ready for a new fiddle to be created with no need to hit remove multiple times. While faith may be an important topic to some, does it really warrant promotion from a technical help site? This produces no output at all when run is clicked (I expected an error about snapshot isolation not being enabled). There is no indication that db<>fiddle has tried to execute the script at all. All of them included in the contrib module of the main distribution. See: "Appendix F. Additional Supplied Modules"
intarray, hstore and unaccent are essentials, and tsm_system_rows is tiny and convenient. Would you think it's possible to install those? Is there a chance we get Oracle 18c version? Oracle Database 18c XE now available! When I run(SQL Server 2012-2017) I can't see any result set. Looks like it would be handy for some of the answers I've been posting to https://codegolf.stackexchange.com/, and what would be super helpful would be to have a byte counter somewhere underneath each code box, since most of the contests are scored by size. Bug: If you [remove] all sections, then you get just the separator line, and no way to get an empty section. Clicking [+] just gives more separators. This is just question/minor bug? When do we get rows count? The only difference is that I commented WHERE clause. Oracle collection and COLLECT is not showing any result. But there is no result at all. Note: Similiar scenario with PostgreSQL is working fine. 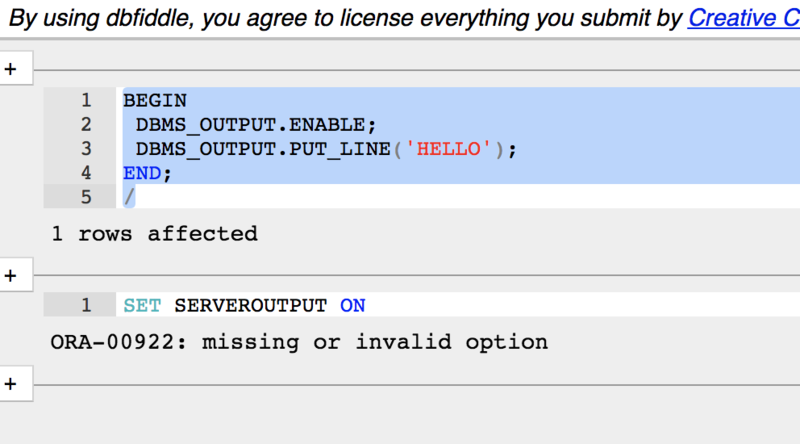 No CREATE TYPE privilege under Oracle. It would have been greatly helpful if included, especially to test/ demonstrate queries and PL/SQL code containing collections of records and TABLE functions. I'll put this in as an "answer" and maybe consolidate my "bugreports" here. I was answering this question, so I used your tool to construct the fiddle. It's a question about SQLite. Here is the fiddle that answered the first part of the question - an UPDATE. To answer part two, I tried this. As you can see, it fails. I'm quite persistent, so I tried db-fiddle (your arch-rival? :-) ) here and it works nicely. I am confused at this point. I really love the db<>fiddle. But sadly I am never able to edit my fiddles with my smartphone (Android, Chrome). There is a very strange behavior with text typing. It sometime overrides the original text when trying to insert something or puts the new text on wrong positions. It would be great to use your fiddle on mobile devices as well. Maybe you could check this because at the moment it is really not usable for me. I really like to know: When I execute multiple statements in one field (e.g. 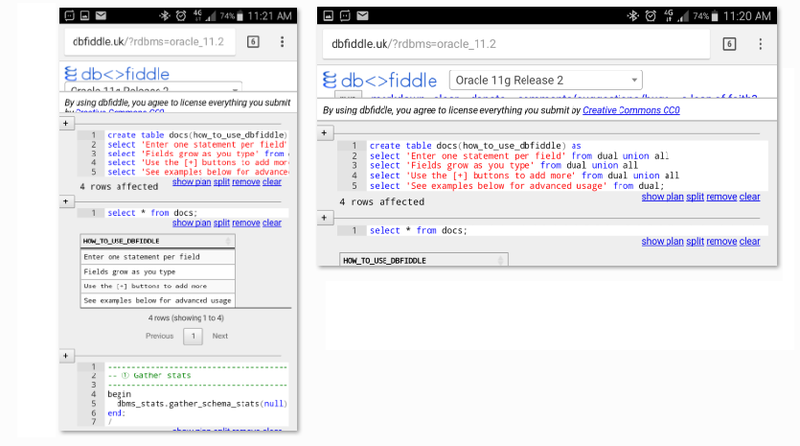 https://dbfiddle.uk/?rdbms=postgres_9.6&fiddle=a0fc52d4e45e4d925b428fabcdee70f5), are they treated as one transaction or are they committed separately? I got a problem with MySQL when I wanted to execute more statements in one field. Why does the multi execution work with Postgres but not with MySQL? First, thank you for the site, it's a very useful tool. Recently MySQL 8.0 introduced JSON_TABLE, however, it's currently not possible to use it in dbfiddle.uk. Note the collapsed row 2 for the empty string in the second SQL field - in the fiddle, not here. Some way to distinguish rows 2, 3 and 4 would be useful. Maybe rendering with a <pre> block would be an improvement? Would also take care of the comments you mentioned. 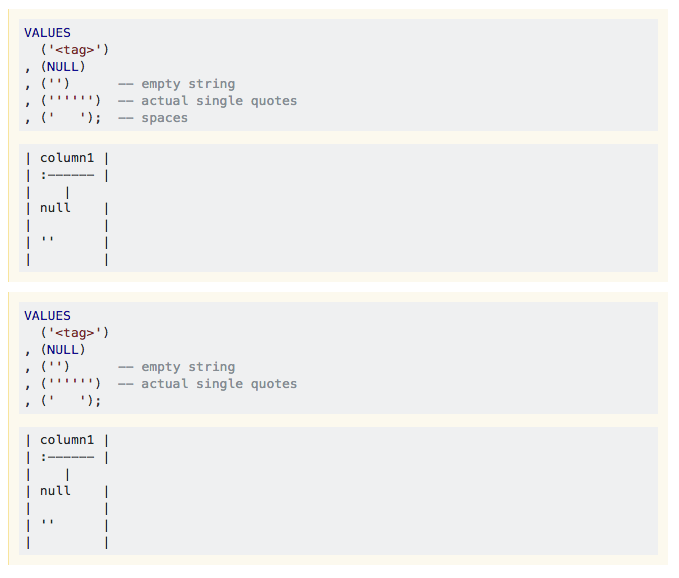 Included your italic null, added italic single quotes for empty string. May be hard to distinguish from literal single quotes. But still an improvement, because the distinction between empty string and space is more important because it's a more common problem. All spaces remain to be solved ... Some corner cases are hard to solve. Most clients have a hard time to get it right. I have to say it once again: db<>fiddle is simply the best. I have a small request. Could you add traceflag 460 to startup parameters after you patch SQL Server with the newest cumulative update? Current CU of SQL Server 2017 is CU9. On SO in the PostgreSQL section there are often PostGIS questions. At the moment I don't know any fiddle engine which supports this framework. So as a suggestion: Wouldn't it be great to install the PostGIS frame along with your PostgreSQL instances? SQLFormat has an API (and code) to clean up syntax to make it readable. How do we promote specific databases (or tag areas) here?